Perfect for a summer night out, the two piece Straw Clutch Set is accented with a multi-color tassel and is sized to carry all your essentials. The smaller clutch can fit nicely inside the larger as a wallet, or can be taken on its own. An inside zippered pocket in the large clutch allows for extra storage. Gift the set to friends, bridesmaids, or keep it for yourself. Coming Spring 2019 FREE Personalization. Set Includes: One large straw clutch, one small straw clutch Dimensions: L: Large Clutch: 11.75". Large Clutch Inside Pocket: 5.75". Small Clutch: 6.75" W: Large Clutch: 8.5". Large Clutch Inside Pocket: 4.25". 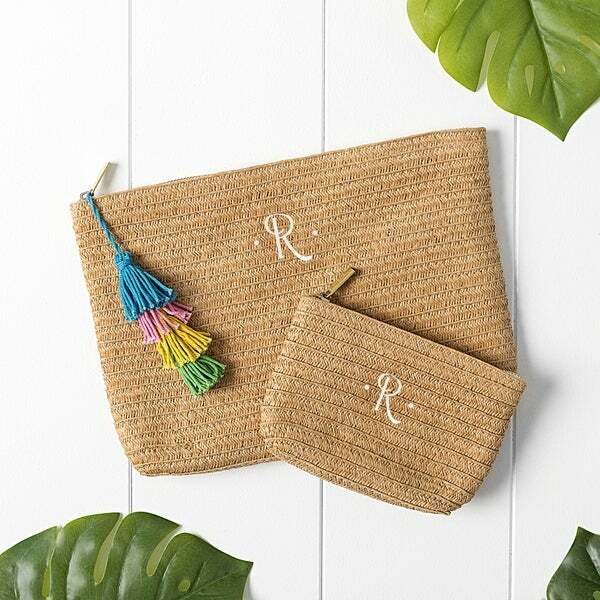 Small Clutch: 4.75" Features: Natural straw construction, ivory lining, multicolor tassels, free personalization Materials: Natural straw, yarn Care Instructions: Spot Clean and air dry Embroidery Options: May be personalized with a single initial at no additional cost. Gucci 510314 Black Leather Interlocking GG Crossbody Wallet Bag Purse Clutch - 7.5" x 4.5" x 2"